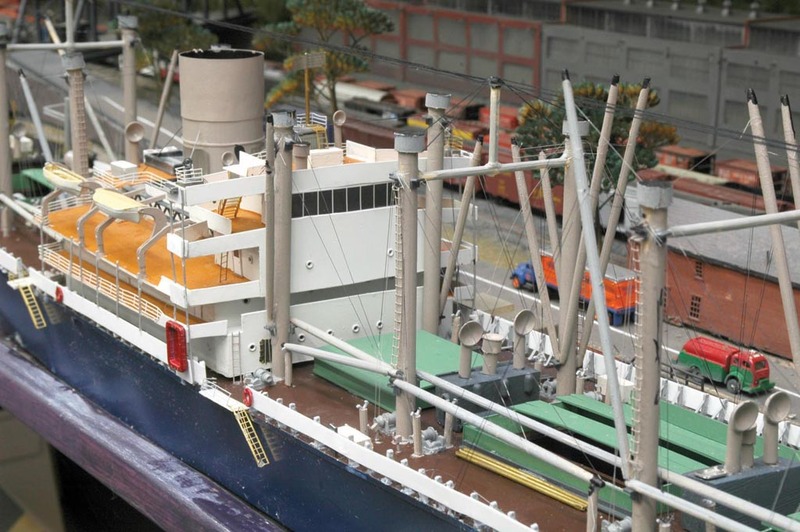 In N scale it is 37+” long, 4.5″ wide and about 6″ high to the top of the masts. In Z scale it is 72.727% of the N scale dimensions. Both N and Z are available now as built-ups for about $4000.00; kit will probably be announced in April 2015. Hi, Other than “Reply” I didn’t see a way to contact you via email. I am modeling the White Pass & Yukon Railway in N scale (narrow gauge) and was wondering if you still produce the C3 kit? I am going through sources and have found pictures of a few container ships that regularly docked at the Skagway, AK wharf (Clifford J. Rogers, Klondike, Frank H Brown), but not many of other ships. However, the C3 is of the right era, and your model looks outstanding, so I am very interested if you are still making them. Yes, the C3s are still available as break bulk cargo and as container ships. Just as a matter of information, the T3 was extremely rare. I took one to scrap many years ago. The T2 on the other hand WAS the mainstay of the U.S. merchant tanker fleet for decades. I sailed on more than a few. Also some C3’s. Fine model, by the way..
Master, Ocean Steam and Motor Vessels, Any Gross Tons -ret. I agree and should probably reclassify this as C2/T2. But the literature I had available said C3. Many classifications were based on taxes and few were challenged. It’s right on the borderline for length and perhaps too narrow for C3?